I was last in Munich in 1983 on the quintessential College graduate backpack tour enjoying the vibrant city life on less than 20 DM per day. Needless to say Luxury Resort Hotels were not on my itinerary, but I did remember trekking past the Bayerischen Hof making note of the curbside fleet of Porsche 911s as we headed to the “other side of the tracks” seeking a 5 DM/night hostel. I vowed to return to Germany but next time without all my worldly belongings strapped to my back and absolutely not sharing quarters with dozens of my closest friends. Over the years my family of 5 have endured this and other tales of my European Travels always followed by “I'm going to take you there someday! Well, the day finally arrived with Munich on the itinerary and the Bayerischen Hof on the top of my list for accommodations. We wanted to stay in heart of the historic city in a full service hotel allowing us to easily venture out to attractions and skip on back for a pool side beverage. The Bayerischen Hof did not disappoint. Location, location, location. Opened in 1841 at the request of King Ludwig I who wanted a First Class Hotel in Bavaria, the Bayerischen Hof lies in the center of Munich. The hotel offers 337 individual styled rooms, including 74 luxurious suites plus it's own theatre. It has five restaurants and six bars from a roof top pool /lounge/spa to a downstairs Night Club. The statement in the elevator is “No two guest rooms are the same because no two guests are the same.” I agree. When you browse through the published guest book you can see how they can make that remark. The incredible list of notable guests reads like the who's who of the world of Royalty, Science, Art, Music and Politics - … From Albert Einstein to Michael Jackson the Dalai Lama to Mohammad Ali Even Meat Loaf stayed the weekend here! No wonder, The Bayerischen Hof is the definition of a full service luxury hotel. You can tell you are on a different level the second you arrive. The team of Valet/Bell Hops quickly and cordially “take care of everything” while you enter the main lobby. As we quickly got to our two adjacent rooms - (they have a lot of connecting rooms, which are perfect for families who want to stay near their children but also want to have their privacy.) - each had their own character but both were very spacious, with luxury accents and very very comfortable. First our luggage arrived and was stowed then a wonderful fruit and cheese plate arrived along with a fresh bucket of ice and mineral wasser then finally our turn down service arrived and made sure we had all the towels/robes/slippers and everything else we needed. Next was time to test drive the robes and slippers and head to the 7th floor pool and deck. This area is a spectacular setting overlooking the Historic Center of Munich with clear views to the Marienplatz, St. Peters Church, and many other historic rooftops and towers. The sparkling pool has a retractable roof that was opened to the crystal blue sky. Poolside service includes host of snacks and beverages. Adjacent to the pool is the Blue Spa Lounge and restaurant. We made reservations for 7 and headed down to tidy up. I always look for that unique over the top amenity and found it in our bathroom. Not only were the thick embossed towels luxurious, they also were heated! They actually have towel racks with hot water running through them gently warming your bath towels. Huge bathrooms with a private area so you can get ready while others relax behind the doors in the room. 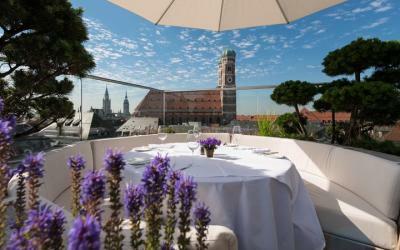 At the Blue Spa we had a special table (pictured below) on the corner of the roof with magnificent sunset views of the historic center of Munich. Lovely healthy meal followed by a nice evening stroll around the busy yet peaceful city center. One of the first sites you see is the Michael Jackson “unofficial, official Memorial” right outside the front door of the hotel. 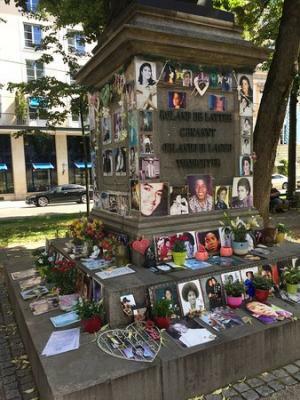 When the King of Pop died ardent fans created a makeshift memorial at the base of a statue honoring the Franco-Flemish Renaissance composer Orlande de Lassus. Not sure exactly why other than Michael did live at the Bayerischen Hof while in Munich and for some extended times. The rumors that the Bayerischen Hof was where he dangled his baby are false, that was in Paris – but I think adds to the idea of the tribute with constant flow of fans and spectators dropping off pictures, flowers, crazy notes, tearful selfies, spontaneous moon walks and everything else you can imagine. It was an interesting observation time. After a pleasant evening stroll we headed back (again you are literally two blocks from everything!) Now it was time for some night clubing. Throughout the day we heard great sounds of Latin music coming up the lobby stairway not realizing that night's band was rehearsing. The Night Club bar is a very intimate room with small dance floor that happened to have a 8 piece band jamming on the night we visited! We loved it! Dancing our evening away to great tunes in a very uncrowded and safe environment. The Bayerischen Hof has five restaurants and six bars culinarily leave nothing to be desired. From traditional Bavarian food to Polynesian cuisine – you can enjoy a great variety of food in unique environments all with the unmistakable touch of luxury. Although over 100 year old, the Bayerischen Hof is 100% up to date with renown French star designer Andress Putman and famous Belgian interior designer Axel Vervoordt providing unique modern touches to the historic facade. We didn't see it but Vervoordt is currently working on a 350 Square Meter penthouse suite for the next King of Pop to visit! Overall the Bayerischen Hof is as recognized by multiple sources – One of the finest grand hotels in the World! To inquiry about special family packages and general information please visit.